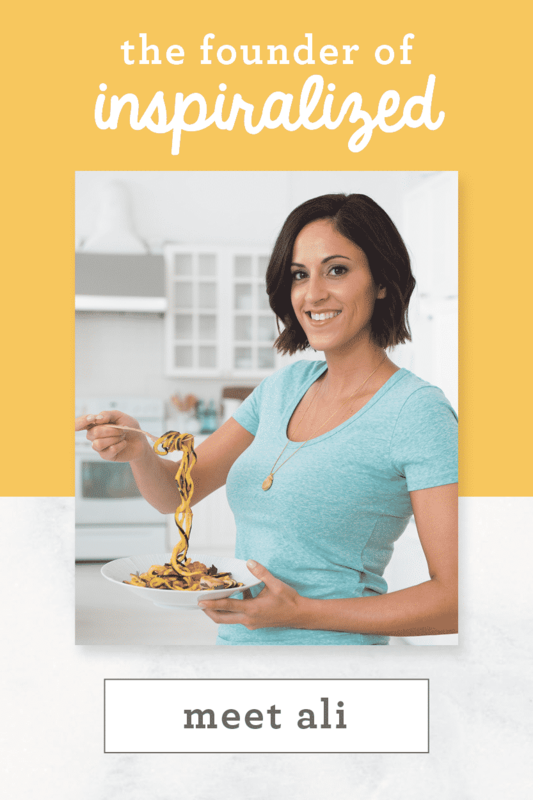 Tomorrow I’m rounding up all of the classic pasta, noodle and rice dishes that I’ve Inspiralized. 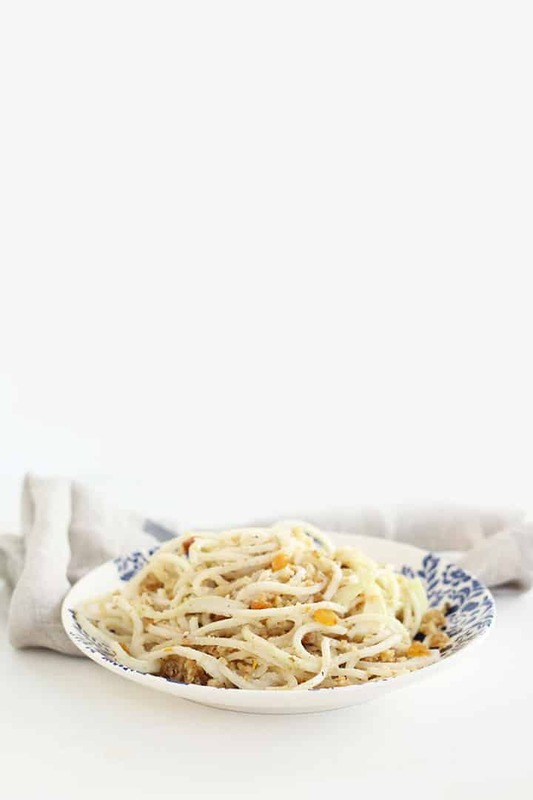 So, today, I’m posting a classic to add to that list: spaghetti alla foriana. 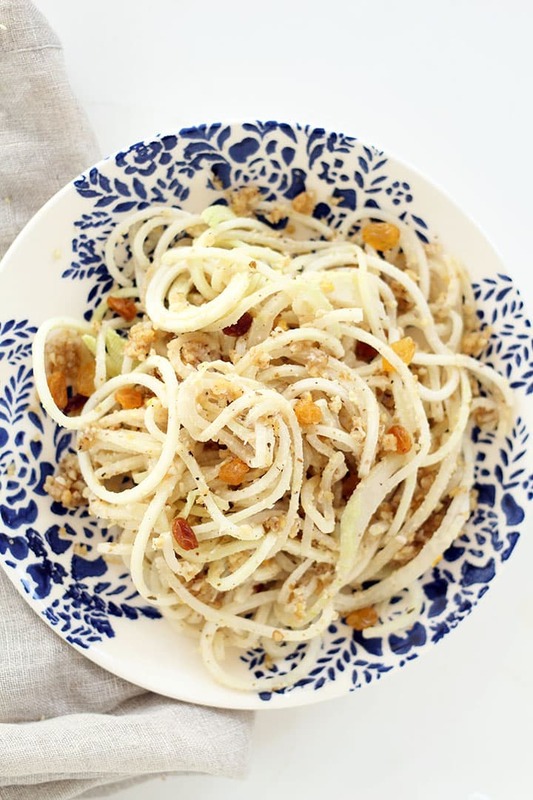 Instead of regular pasta, I’m using kohlrabi noodles, but this dish is so spectacular (I really mean that word!) 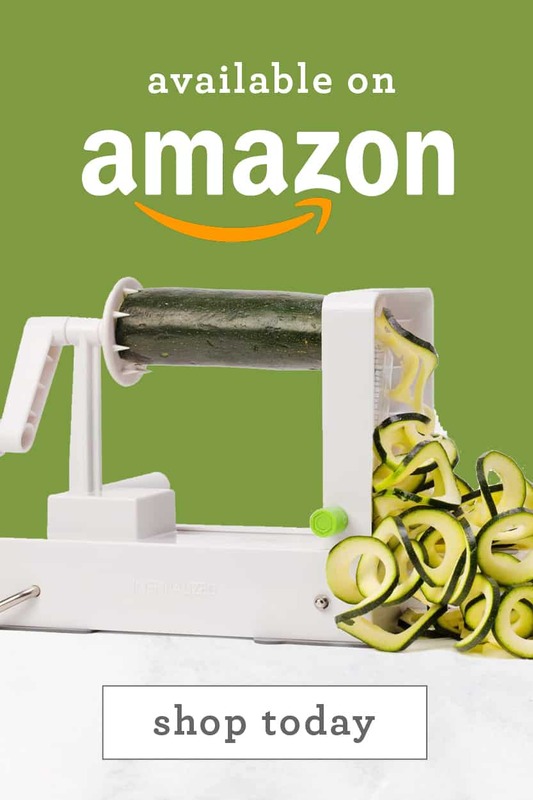 that it will go with all kinds of spiralized veggie – zucchini, sweet potato, beet, carrot – any! The intense flavor from the walnuts, pine nuts and garlic is ridiculously delicious that when I took my first bite, I wasn’t happy, I was mad – how did I not think to make this sooner?! Honestly, my mind was racing when I dug my fork into the plate – this simple sauce (foriana) can be used as a crust for a casserole or just as a mix into a tomato sauce. It’s got such a wonderful rich, nutty, garlicky flavor that enhances the flavor of everything it combines with. I chose kohlrabi, because I wanted to switch things up a bit and I hadn’t used it in a while. Kohlrabi has a mildly sweet flavor that tastes like a radish and a cucumber got together and had a baby vegetable. Seriously! 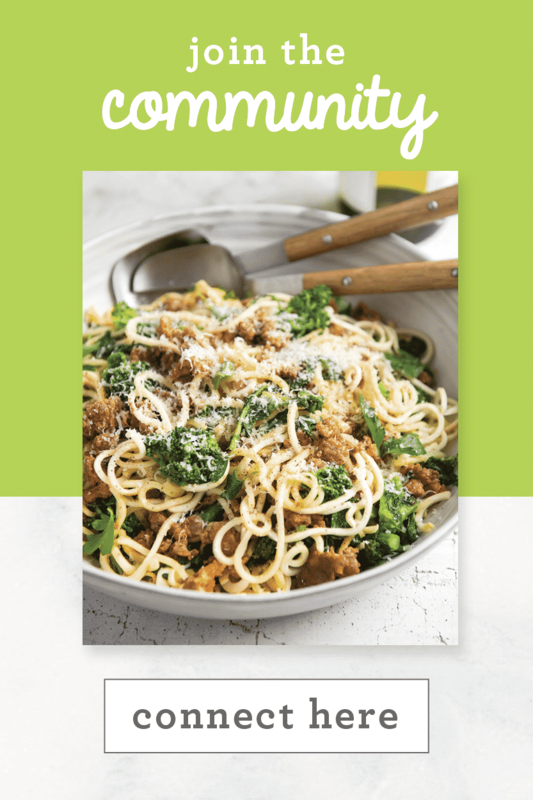 That flavor profile is perfect for this foriana sauce, because the refreshing bite of the kohlrabi helps lighten up the garlicky tones. Also, kohlrabi cooks quickly and has the best al dente crunch. Plus, it doesn’t release much liquid when cooking, so you don’t end up with a bowl of soupy noodles! As for the raisins, well, who wouldn’t want a little bit of soft sweetness in their pasta? The golden raisins are not only beautiful in this neutral toned dish, they offer a lovely texture and sweetness that complements the pine nut and walnut flavors. If you’re like me and recovering from a fun weekend of Halloween festivities, this is just the kind of dish you need – healthy, flavorful and easy to make (mostly with pantry items!) The walnuts are jam-packed with heart healthy amino acids, powerful antioxidants to help with aging and omega-3s that help with brain function. Can you tell that I love spaghetti alla foriana? I can’t wait to round up all the classics tomorrow on the blog! What’s your favorite way to use kohlrabi? 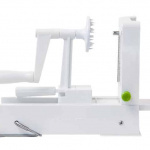 Place the walnuts, pine nuts and garlic in a food processor and pulse until finely chopped. Place a large skillet over medium heat and add in the olive oil. 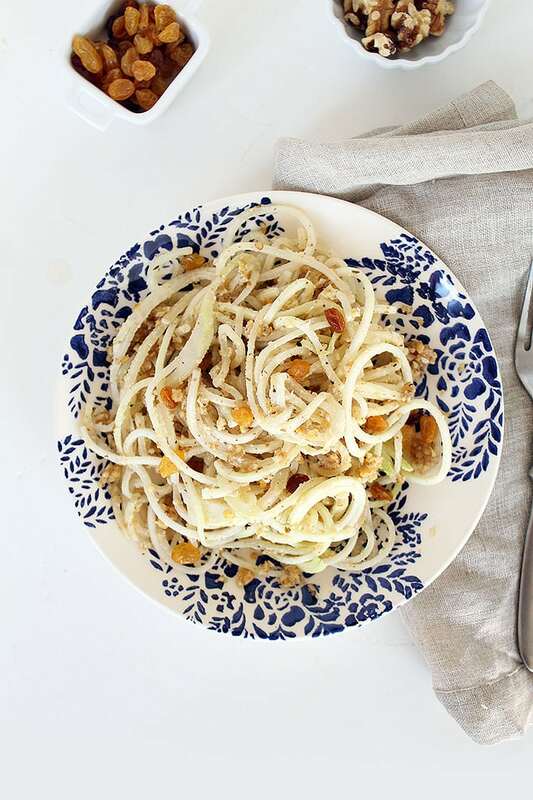 Once oil heats, add in the kohlrabi noodles and cook for 2 minutes or until they begin to soften. Then, add in the oregano, pulsed nut mixture, raisins and season with salt and pepper. Cook for 3-5 minutes, stirring constantly to avoid burning the nuts but just enough to fully cook the kohlrabi. I've made almost everyone of your recipes. Really enjoyed them, they are all well seasoned and delicious. Saw a Kohlrabi in the store the other day and wondered if that could be spiraled, so was happy to see your new recipe today. Never thought that I liked some of these vegetables before and now I am enjoying them in their spiraled form in your recipes. I love kohlrabi, even though I haven't eaten it in years. I've always just put it in salads. This recipe sounds great, except that it doesn't contain enough protein for me, and it would be hard for me to add any with the level of calories it contains. Bummer! I'll have to see what I can come up with to make it work. On the menu this week FOR SURE! Thanks for another delish gem. I cannot for the life of me figure out which glad is A, B and C.....nothing is marked. Can you help? 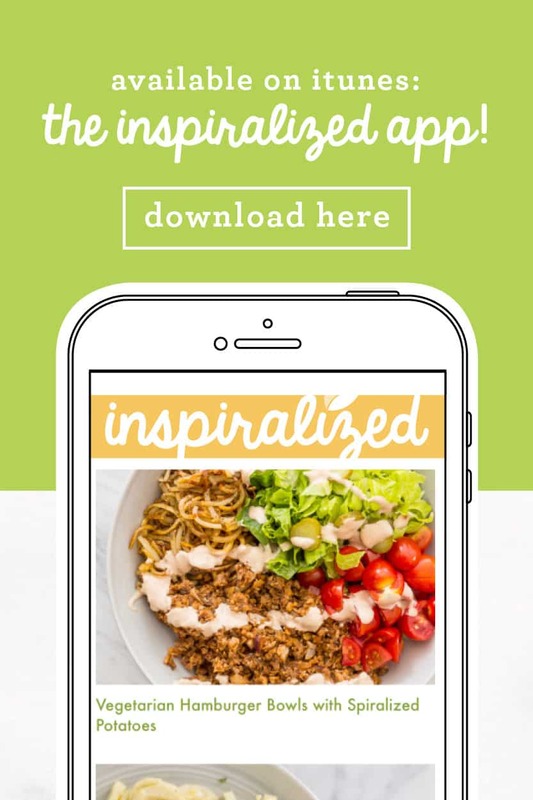 Cherie - check out my "how to spiralize" page! I don't think I have ever used kohlrabi! This sounds and looks amazing though, so it'll be on my grocery list this week for sure. 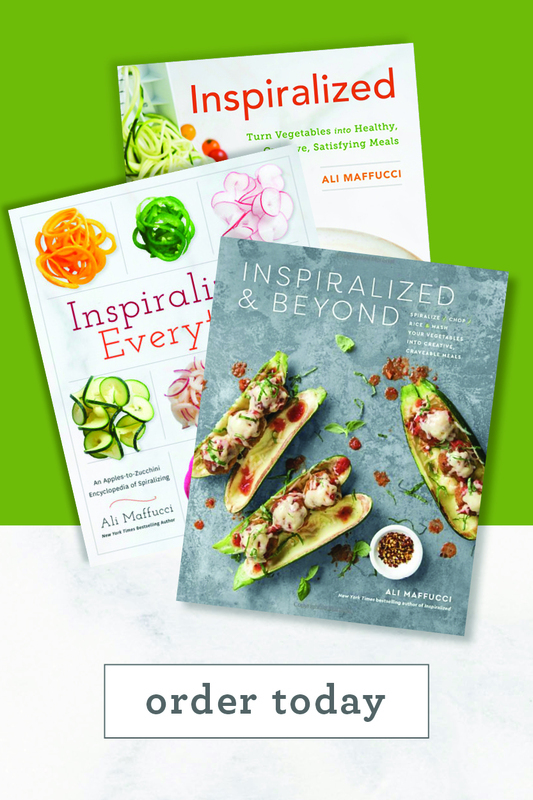 I'm excited to expand my spiralized veggie horizons! 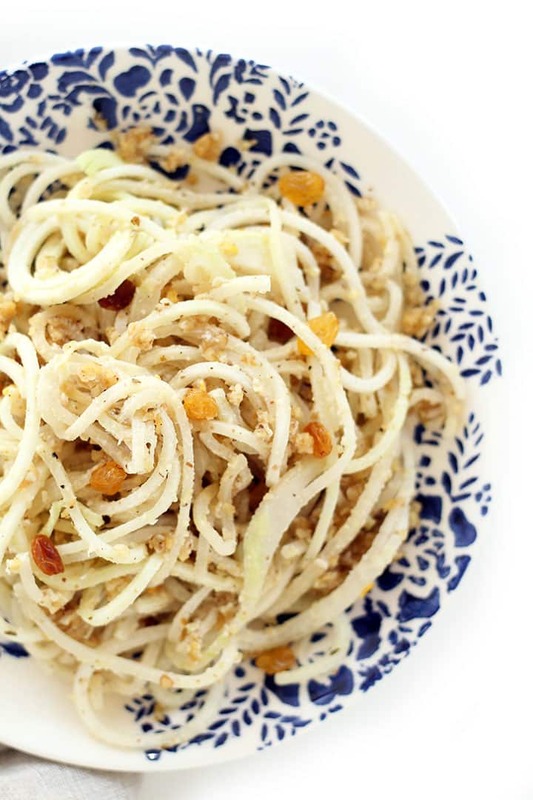 I would never have thought to spiralize kohlrabi. Genius! This is an excellent recipe. I used some huge kohlrabi from my garden and made 2.5 x the recipe. My 6 year old ate his weight in kohlrabi. Next time I will add grilled chicken to get some protein and make it more of an entree. Excellent! OMG! This was delicious! Love love this. Thank you! I'm so glad you tried it! Thank you! I've gone to 3 different grocery stores (the last being Whole Foods & they didn't even have any kohlrabi!) looking for something other than small kohlrabi, no luck :-(. I just re-read your post and came across the suggestion of changing up the vegetable. I've got some lovely golden beets and I'd planned to roast them, but now, I'm going to use them in this recipe! Tell me, should I use everything in the recipe as listed when using kohlrabi or are there some minor changes to adapt to the beets? I'd also like to cut the fat back some so is there something I can substitute for the walnuts? We love the flavor of pine nuts so I'll keep that in as a treat, so I've elected to swap out the walnuts! Any and ALL suggestions will be appreciated! Thanks! PS Ali, YOU ARE AMAZING! Ali (or anyone)? Do you think it would be possible to make the pulsed-nut mixture ahead of time? I'm thinking this might be a nice quick camping dinner and I can store the nut mixture in the fridge (yes, I DO camp with my Spiralizer!) :) Thanks!! I had 3 kohlrabi so I increased the recipe 50%. Was too nutty for us. Just felt like it needed something else to balance the nut flavor. 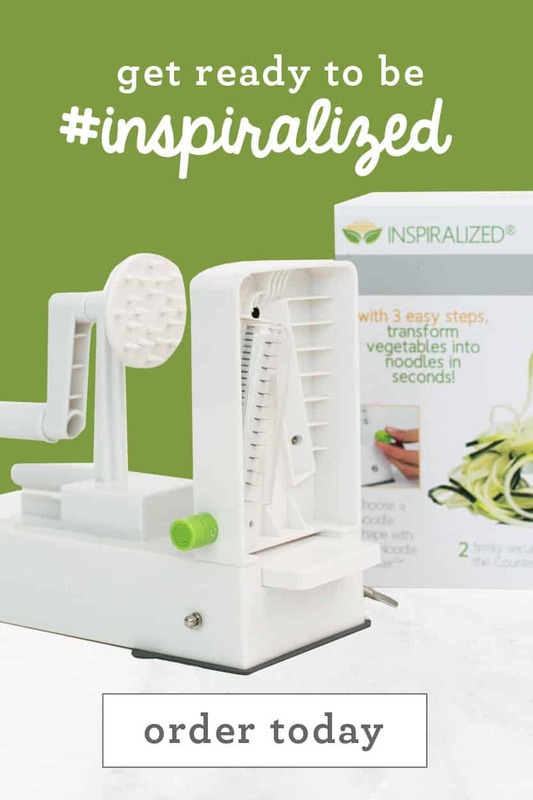 The kohlrabi spiralizes beautifully and I will definitely use these noodles again. I made this for dinner last night, and not only that, it was my first time having kohlrabi! I didn't cook it quite enough, it was still pretty crunchy, but the flavour is nice and I really enjoyed the nuts/garlic/raisins in it. Next time I'll add the salt to the nuts/garlic in the food processor, but no reason to change anything else! I tried to take a photo for instagram, but my phone was at 1% and would not cooperate, and I was too hungry to wait! Thanks, this is a keeper! 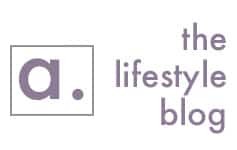 This is great to hear, Anastasia!